I have been caught in the dreaded cycle of a full load of groceries, yet nothing for dinner. How does that happen? Anyway, I was scrounging around the other evening and ended up with a lovely little dinner. Now, I know salmon patties conjures visions of the early bird special at the local cafeteria, but think of them as akin to crab cakes. But more affordable and full of all those omega threes and what-not. I have no idea what an omega three is, but it's good for you. 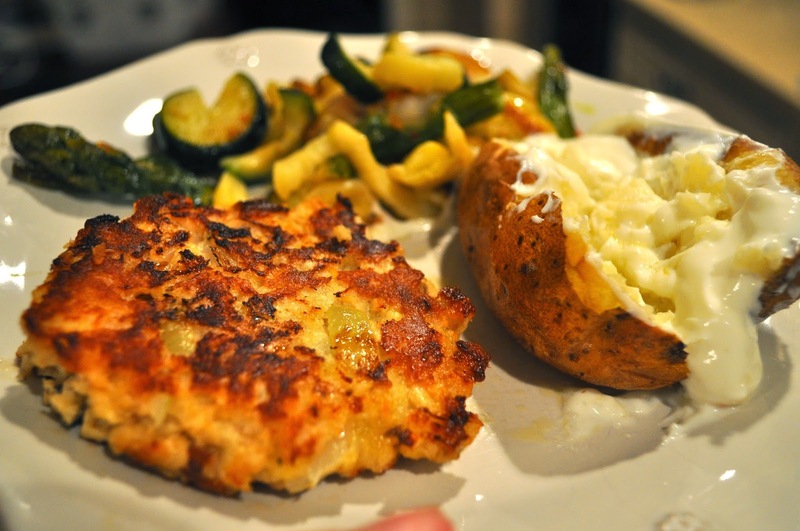 Salmon patties were my favorite as a child, and DH and Deeds snarf them up as well. Paired with a baked potato and some roasted veggies from the fridge, we were good to go. My recipe differs from my grandmother's and mama's. I've gone rogue, but it's still pretty tasty. 1. Drain the salmon, reserving the liquid. Flake the meat into a medium bowl. Melt butter in a large skillet over medium- high heat. Add onion, and cook until tender. 2. Add the onions with the panko, eggs, parsley, mustard, mayonnaise to the salmon. Mix until well blended, then shape into 8-12 patties (I like mine really thin). If the mixture is too thick, add some of the reserved salmon liquid, or some more mayo. I like to make my patties earlier in the day, or even the night before and refrigerate. This helps them hold their shape. 3. Melt shortening in a large skillet over medium heat. 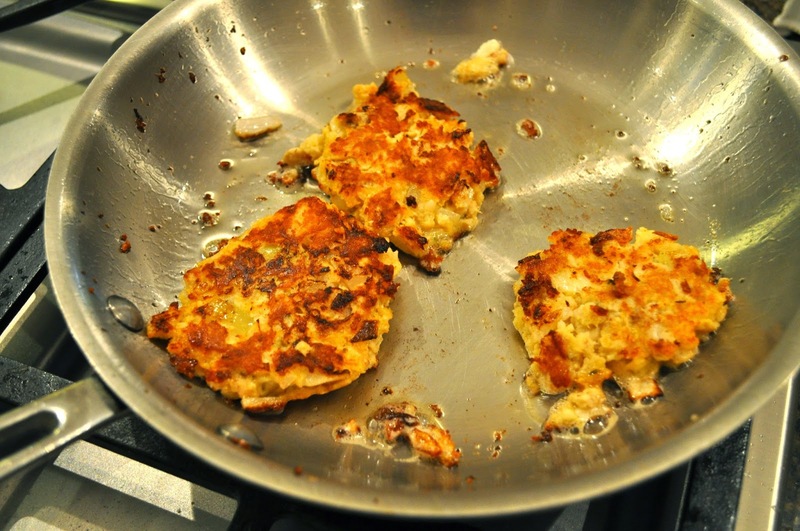 Cook patties until browned (about 5-6 minutes), then carefully turn and brown on the other side. Drain on a paper-towel lined plate. 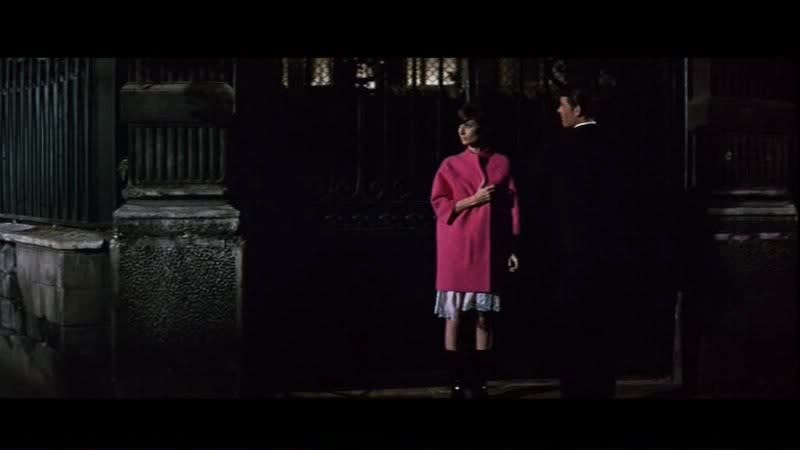 I had an enjoyable evening the other night watching "How to Steal a Million", a 1966 gem starring Audrey Hepburn and Peter O'Toole. It's on HBO OnDemand right now, if you're interested. 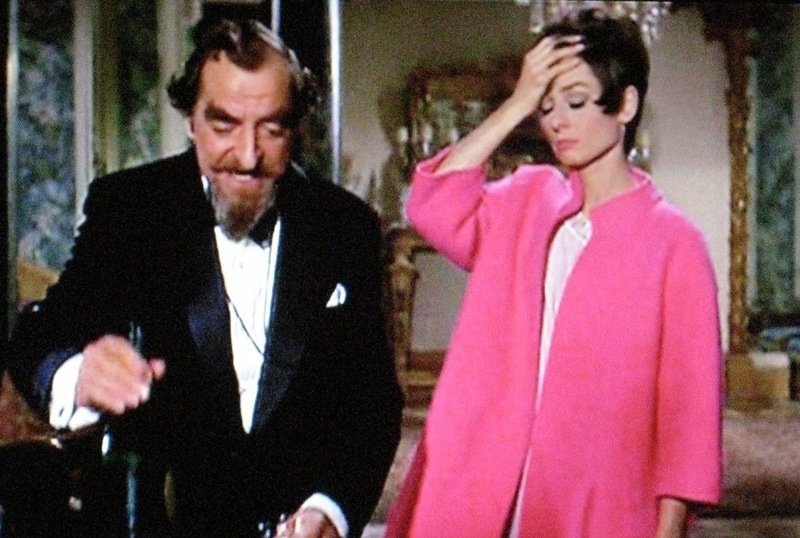 The clothes, were amazing- the best part of the film for me. Heavenly. Here's a good post breaking down the fashion in the movie. 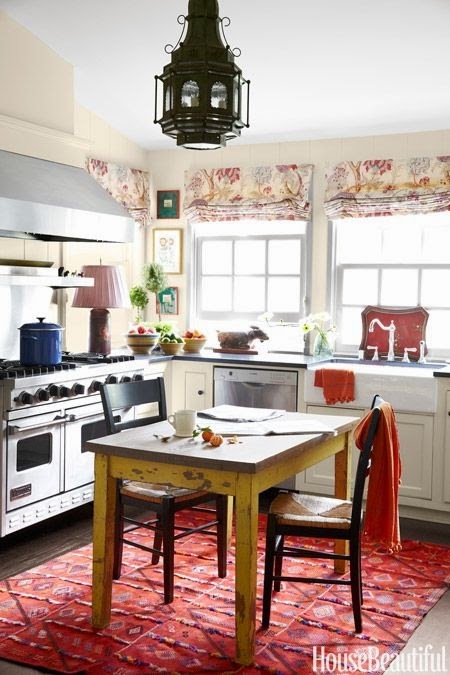 I'm obsessed with the Schuyler Samperton cottage featured in the latest House Beautiful. Look at this kitchen! I'm super guilty of many of these, but this article from Dave Ramsey on ways we waste money on our children is interesting. 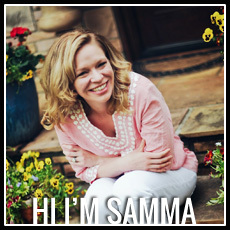 Another good read is this interview with the creator of Steel Magnolias. I must admit, I was absolutely thrilled when I (cringing with embarrassment right now) took the Southern Living "Which Steel Magnolia Are You?" quiz, and got Clairee. Yes, I am 33 years old and took a "what character are you" quiz. At least I got my favorite character. Okay, back to watching the premiere of "How to Get Away With Murder". I'm intrigued, although the law school scenes are giving me traumatic flashbacks. 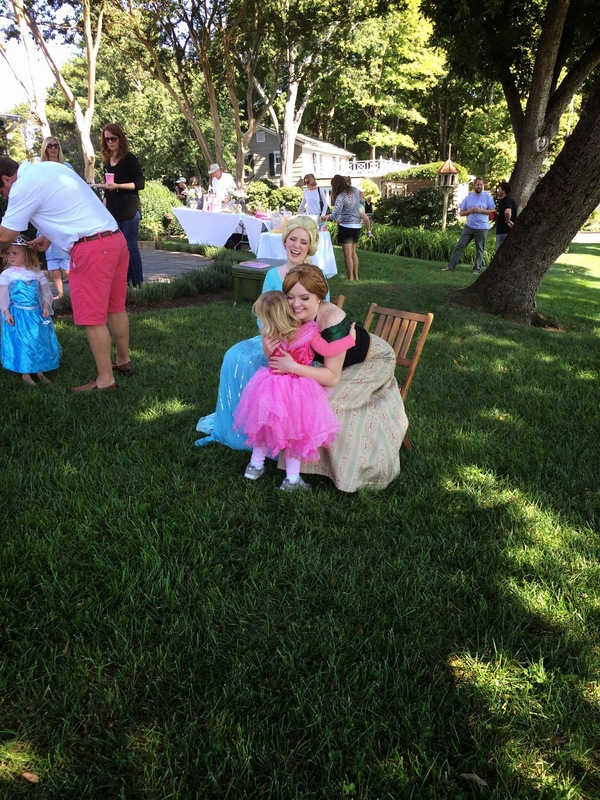 Can I tell y'all how much I love kids' birthday parties? We are in a spurt right now where there are one or two every weekend. 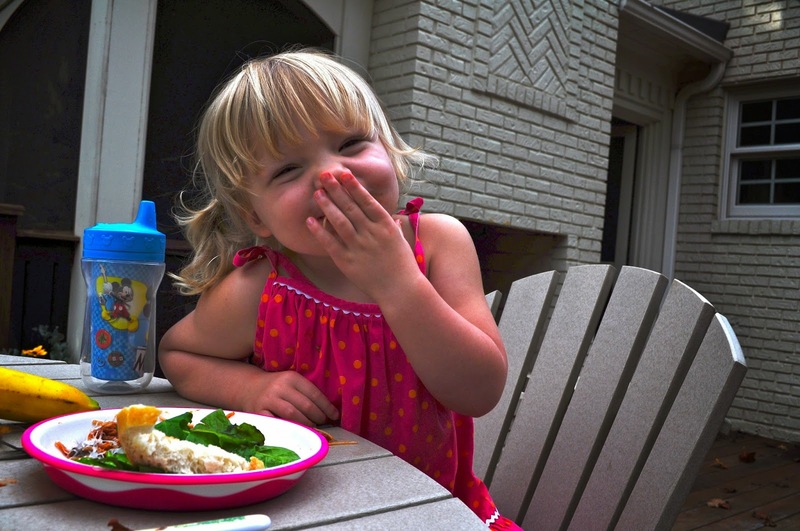 I get to see my friends and Dell Harper is entertained by hers. And she gets to eat cake. And then she talks about said cake all week long until the next birthday. It's Morgan's birthday this week, and she has told me that Daddy wants a princess cake with fairies and Sleeping Beauty and a crown on top. Somehow I think that's a bit beyond my pastry chef skills. I have memories of helping my mama in the kitchen, so seeing her pleasure in cooking just thrilled me to pieces! 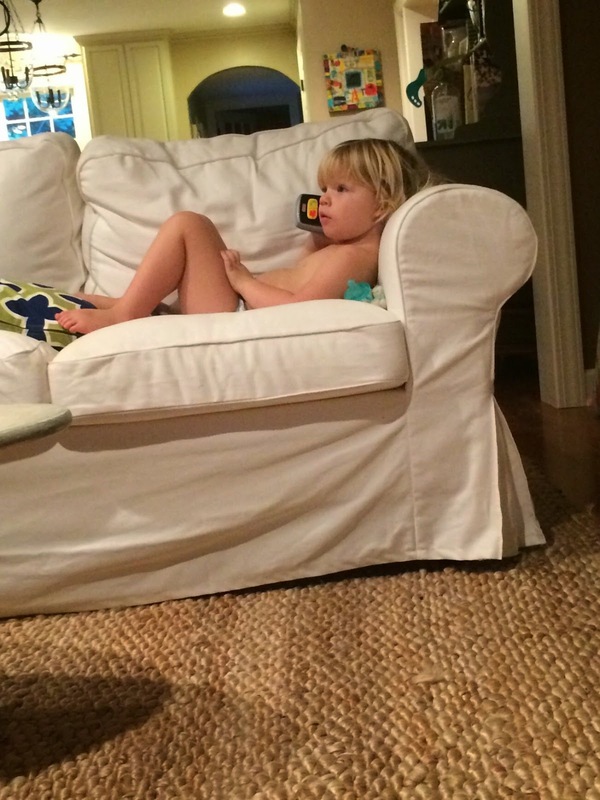 Um, who is this teenager-toddler laying on the couch in a pull-up talking on her pretend phone? It just cracked me up. 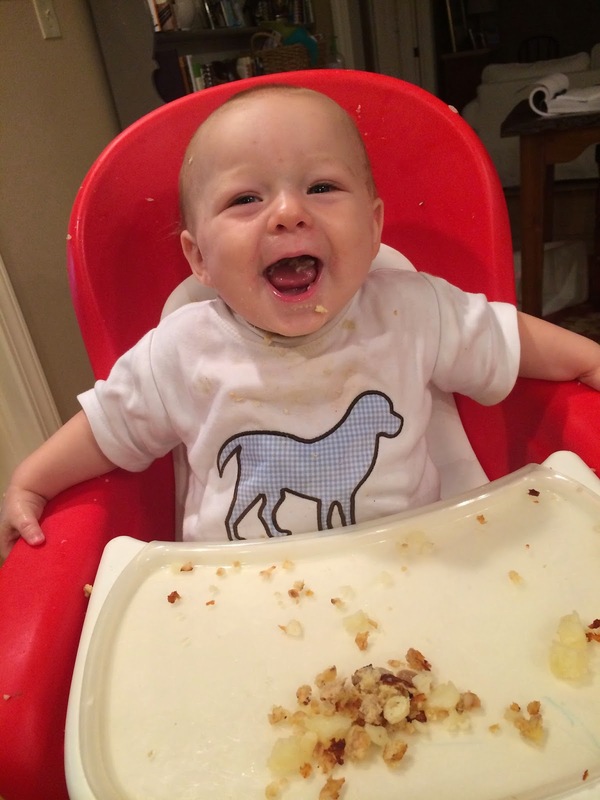 This little guy likes to eat! Anything he can snag is getting in his belly. Probably from all the moving and grooving. crawl crawl crawl crawl. pull up and chew on coffee table. crawl crawl crawl crawl. 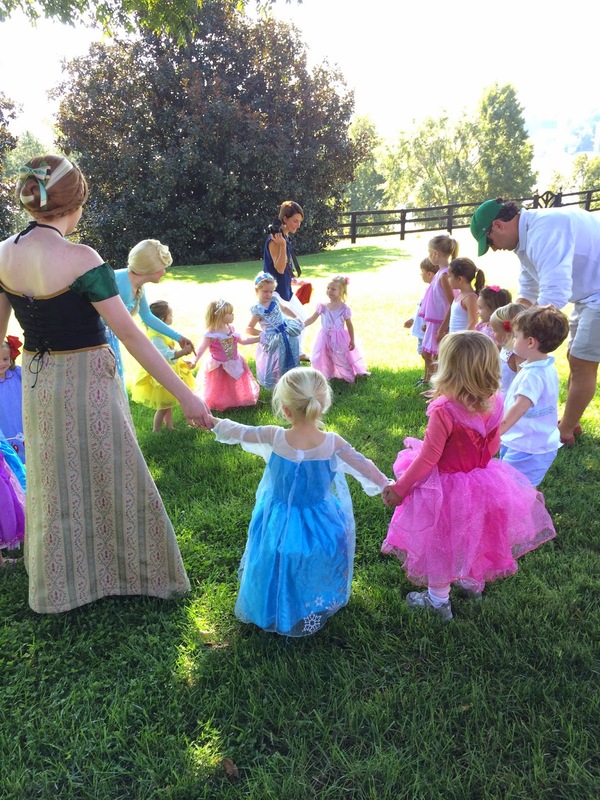 So back to the princess party. 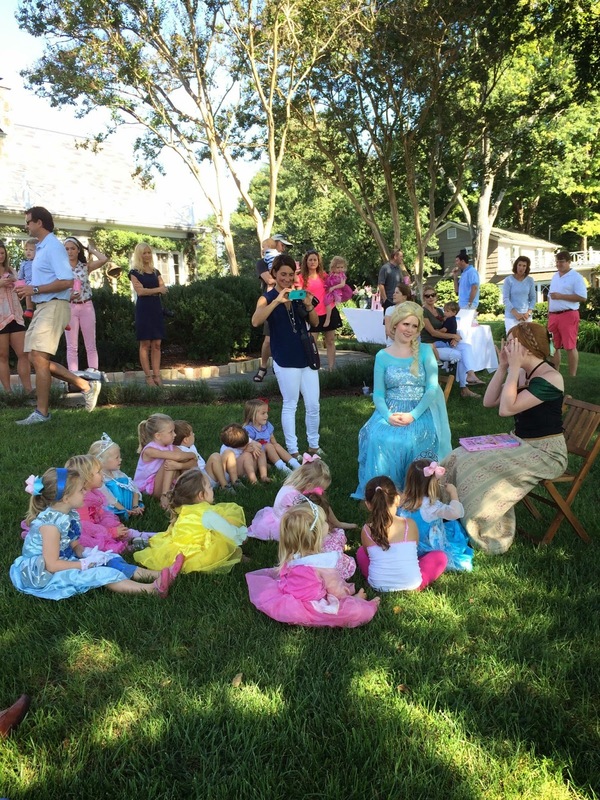 Elsa and Anna came all the way from Arendelle to read the children a story and lead a sing a long. I was having a brilliant idea of becoming Elsa as my alter ego, in order to make my toddler listen to my commands/become enthralled with my every move. Then they starting singing in beautiful a cappella harmony, and I knew my plan would never succeed. Oh, the cuteness. I followed the princess party up with a lovely baby shower, and finished up the day with some laryngitis, thanks to all the chit chat and ragweed. I've never had allergies before, but I think I have now developed them. Is this possible? I am not in favor, not will I succumb to the indoors. I know, I know, fall weather, pumpkin flavored everything, scarves, blah, blah. I do like the weather though- highs of 80, low humidity, and a slight chill in the morning. Lovely! Now, with the new house and all, I am determined not to buy clothes. At all. Unfortunately, the lady of the house previously was a shopper. My mailbox is filled with catalogs every day, which is thrilling to my childhood self who would invent imaginary lives/make paper dolls and hoard catalogs. To someone resisting shopping, it makes it tough. This dress- perfect black dress for fall and winter. Plus it's machine-washable. Or this one? Coziness abounds. 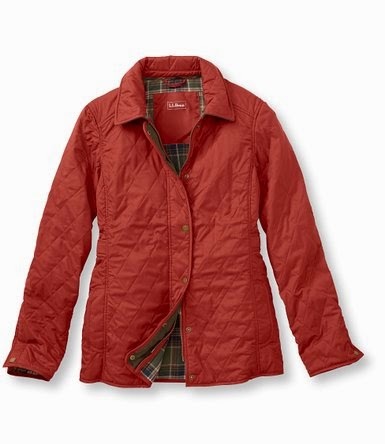 Then this quilted jacket from LL Bean is such a classic. 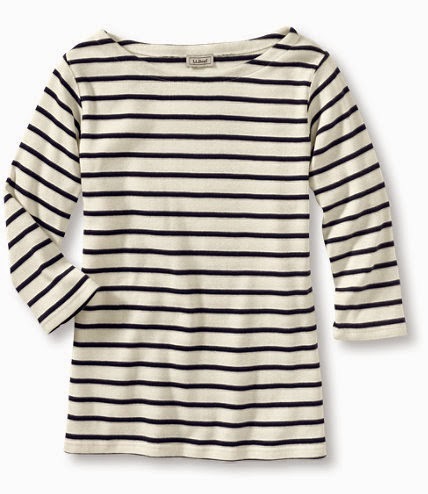 And I always need a good sailor shirt. Um, then I just need to throw on some old jeans and these rain boots. Put a bow on it, baby. 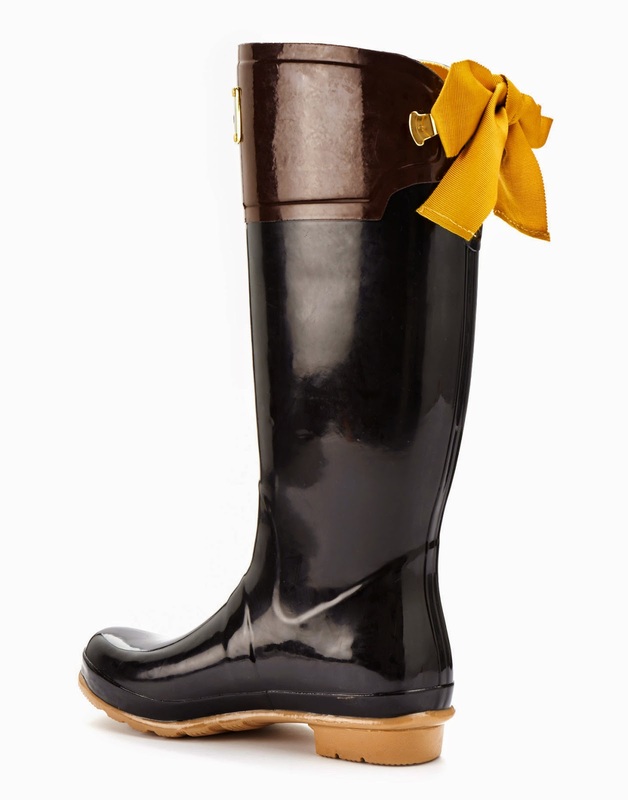 The boots are from a British company called Joules- their kid stuff is adorable! And too high-priced for my little terror. 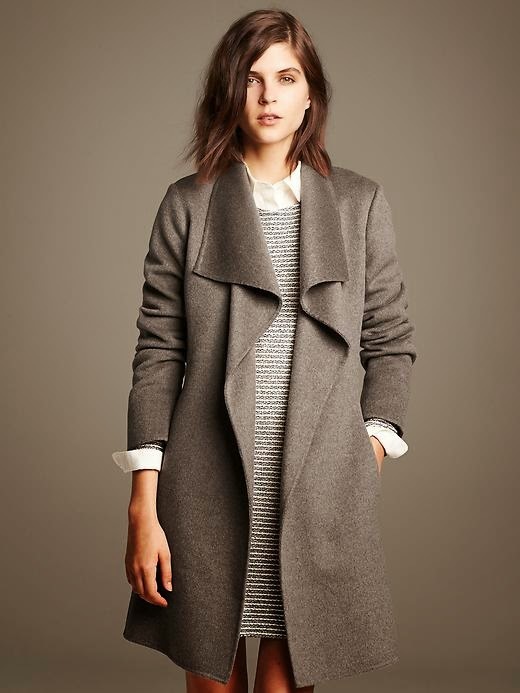 Finally, I have an extreme crush on this super-chic understated coat from Banana Republic. Oh, I can just imagine with my fun green dress from above and some red lipstick. Watch out world. But I must avert my eyes, and get back to reality and all the stuff I need for our house. And bills. And responsibility. But, oooh, those coats. It makes it tough to think about savings accounts when faced with coats on the cusp of fall. Deep breaths and willpower, right? I adore the Miss America pageant. I honestly thought that it was between Virginia and Alabama, and was pretty shocked by Miss New York. She definitely had the cutest clothing picks, and a darling smile, but the cups things was both past its cultural relevance date yet faddish. Miss Ohio's ventriloquism, on the other hand? Ha! I (not-so) secretly loved it! Dell Harper is giving me hell with her afternoon nap- acting like she's all big and doesn't need a nap. I've been too exhausted to fight it the last couple of days, so I put on a movie which she has passed out watching. Any tips? 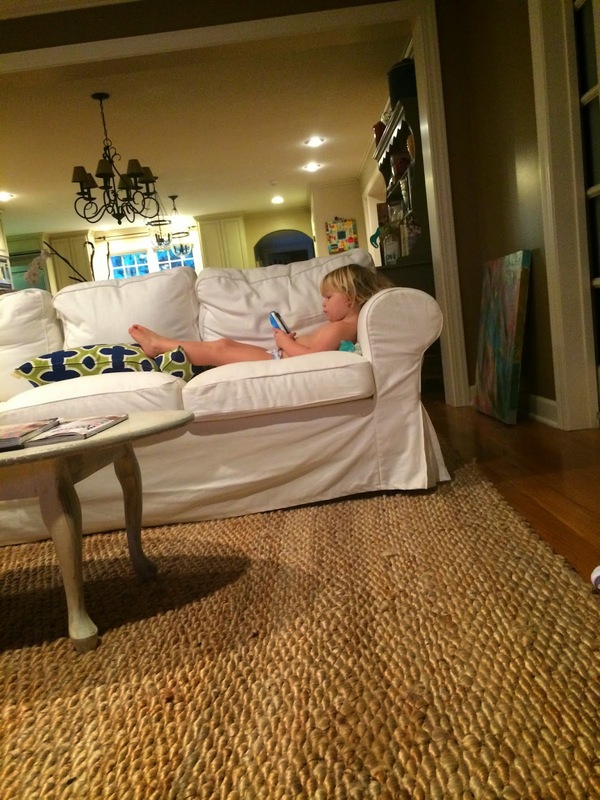 Our epic stay in your bed fights and giving me scary premonitions of her teenage years. 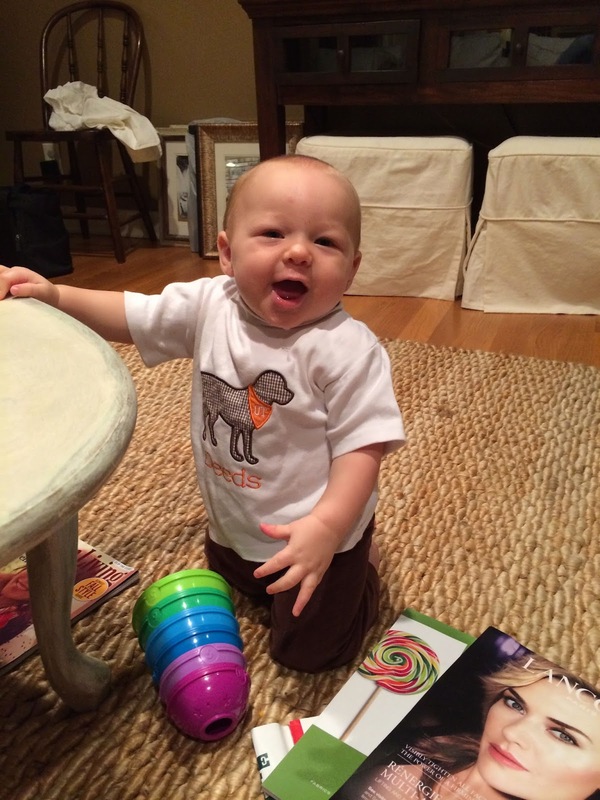 Deeds is pulling up on his knees, crawling, or just moving any way he can constantly. 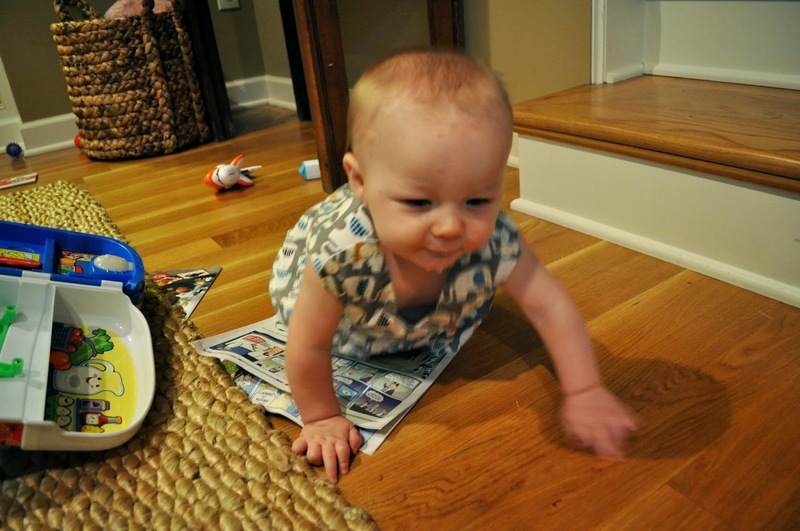 He gets ticked off when he can't get back to sitting up from crawling. It's kind of funny, but also slightly annoying. Poor guy- he's so low maintenance that I complain about adjusting him to a sitting position. Love bug. Morgan and I watched the season premiere of The Mindy Project Tuesday night, then followed it with The Roosevelts on PBS. Pop culture and history- two of my favorite things! So, I just got Deeds in school on Thursdays starting in October- I will now have two days child free to work! Hopefully this will help prevent my imminent nervous breakdown. Finally, you have to read this breakdown of Angela Chase's wardrobe with My So-Called Life's costume designer- it's such a fun, fascinating flashback, and reminds me of my baggy overalls, and thrift store finds of my early years of high school. The grunge-influenced, mixed with hippie-look was quite modest, in fact. My parents should consider themselves lucky. 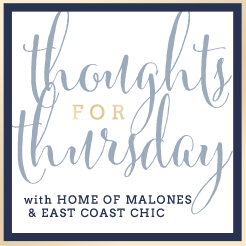 I'm linking up East Coast Chic and The Malones for Thoughts for Thursday! Some days call for spaghetti. With some old school spaghetti sauce. This little gem comes from "Cook and Love It" which was published in 1976 by The Mother's Club of the Lovett School. I have no idea where this cookbook came from, as myself and most of my Lovett alumnae friends were not born in 1976. It garnered reviews such as "More good recipes than you can shake a stick at!" from Jean Thwaite, Food Editor at the Atlanta Constitution, and "It is the nicest cookbook I have ever seen!" from Mrs. Arlene Pirozzoli of North Canton, Ohio. Not to throw shade on Arlene, but it's a typical spiral bound self-published cookbook, so not exactly luxurious, but I digress. 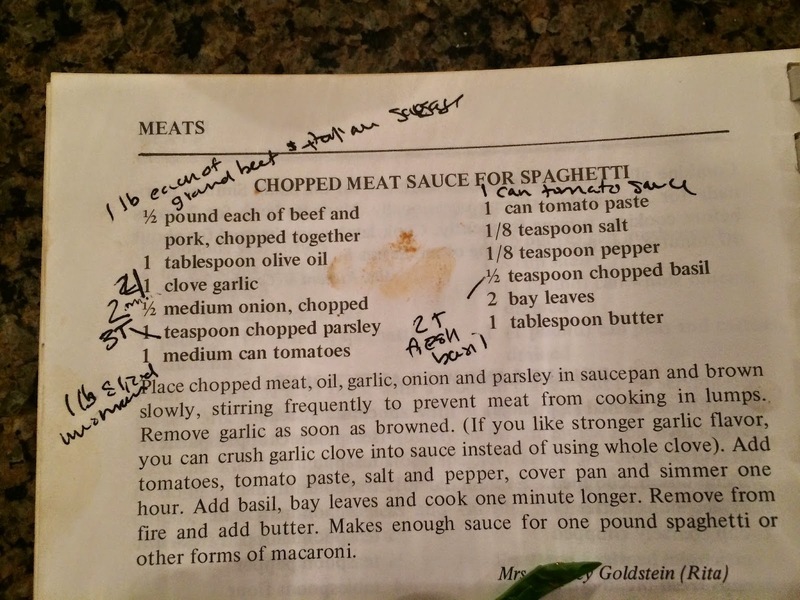 I was intrigued by the inclusion of a pat of butter in Mrs. Goldstein's chopped meat sauce. I updated it a twinge for my taste, and garnered the following reviews over several makings: "This is really good. I'm getting seconds, do you want some more too?" from Mr. Morgan B. of Tennessee. "Da da da da!" from Deeds B., also of Tennessee. "All done with speggeti! I go play now!" from Miss Dell Harper B. of Tennessee. Saute onion over medium hear in a large dutch oven in the olive oil, adding in the garlic and parsley after 3-4 minutes. Add the meat, and brown slowly- frequently stirring to really break up the ground meat. Add the tomatoes, sauce and paste, salt and pepper and Italian seasoning. Cover pot, and simmer for about an hour. Add basil and bay leaves and cook another 5 minutes. Remove from heat and stir in butter (so weird, I know, but trust me). This makes a ton of spaghetti sauce- enough for a pound of pasta, plus enough to freeze for one to two more rounds. In her Virgina Willis' excellent cookbook she talks about how calling something a "bake" makes it sound fancier than a casserole, but not too fancy, like a "gratin". So, if you are like us, about 1/2 a pound of pasta gets eaten, then you are eating leftovers for days. I love some leftover spaghetti, but I also love a full freezer. 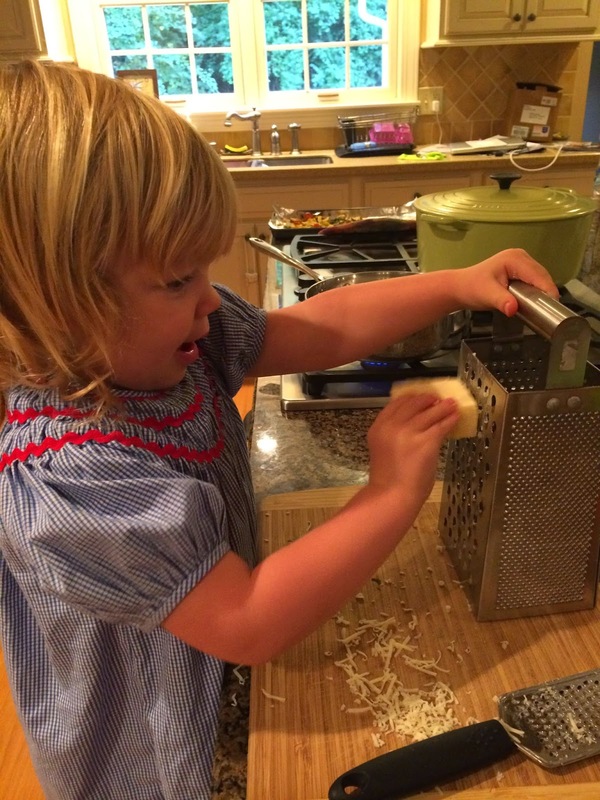 Enter Willis' Pasta Bolognese Bake. Preheat the oven to 350 degrees, and brush a casserole dish with oil. 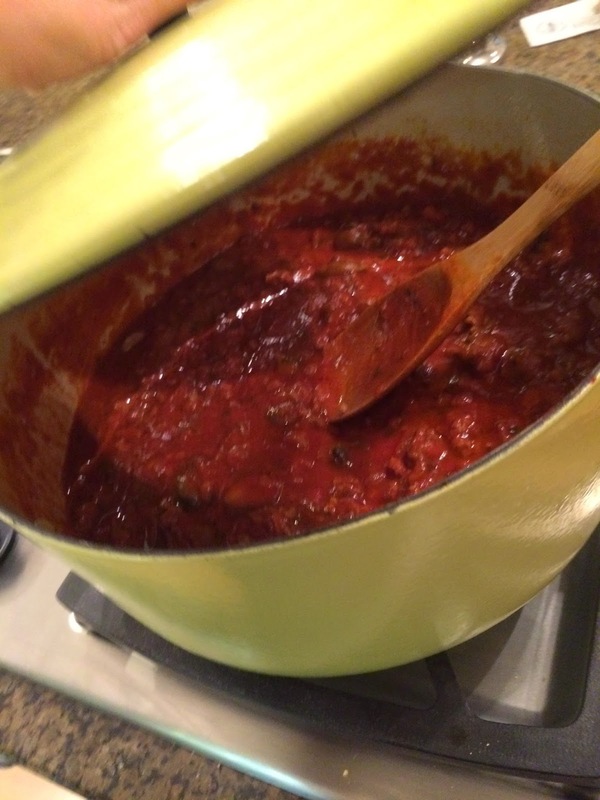 For a half recipe (8x8 pan) combine 4 cups of sauce with 8 ounces of cooked spaghetti. Add two large beaten eggs and stir to combine. 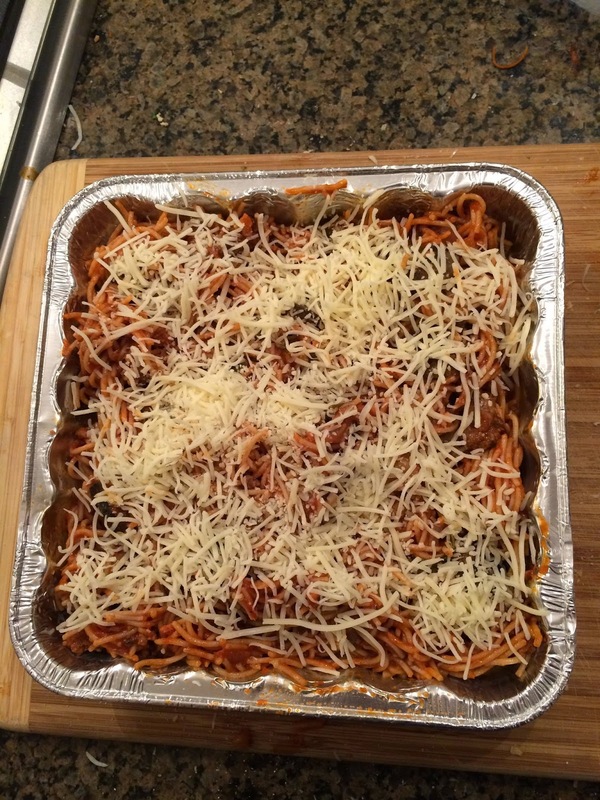 (I then added 2 cups of shredded mozzarella cheese, and topped with a handful). Transfer to prepared dish and bake for 30 minutes until set. This is going in my freezer, so I will bake it for an hour from frozen. 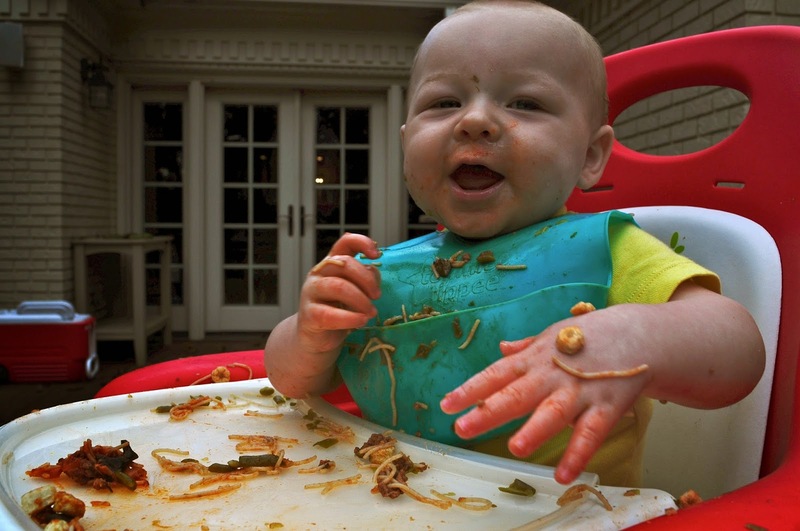 Deeds thoroughly enjoyed his first spaghetti experience. I forgot how baby-led weaning necessitates the need for a garbage disposal in the bathtub drain! Do y'all ever feel like you are teetering on the edge of a complete nervous breakdown? Hoping that's not just me. Ha, Morgan is always reminding me that I need to give up stuff in order to rest more (or not have a mental breakdown). 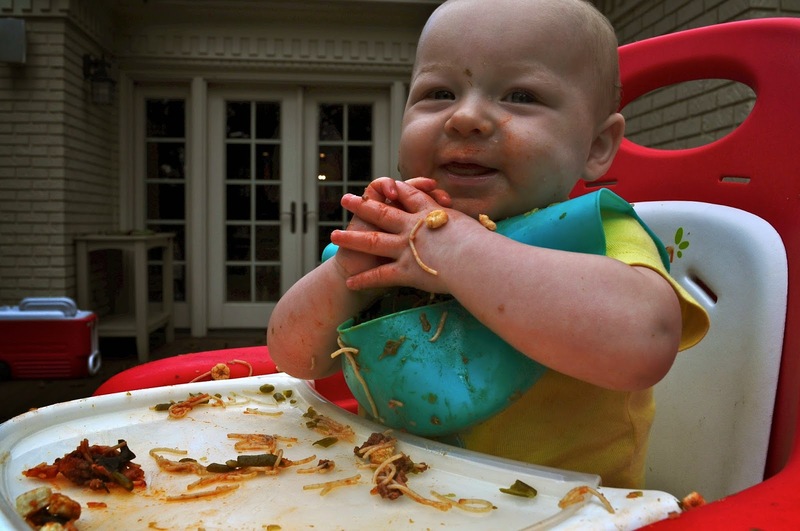 Unfortunately, his suggestions veer more toward not volunteering as much, or not making people new baby dinners (i.e. productive things I also enjoy). I was hoping to give up vacuuming or washing dishes or washing children or weeding or laundry. A birthday party where the fire truck arrived! Thrilling for all (although, it was a couple of the same firemen who rescued DH when I locked her in the car at the pool last summer. Luckily they did not remember/recognize me). Deeds had a couple of parties this weekend as well. Gameday babies at Charlie's first birthday! 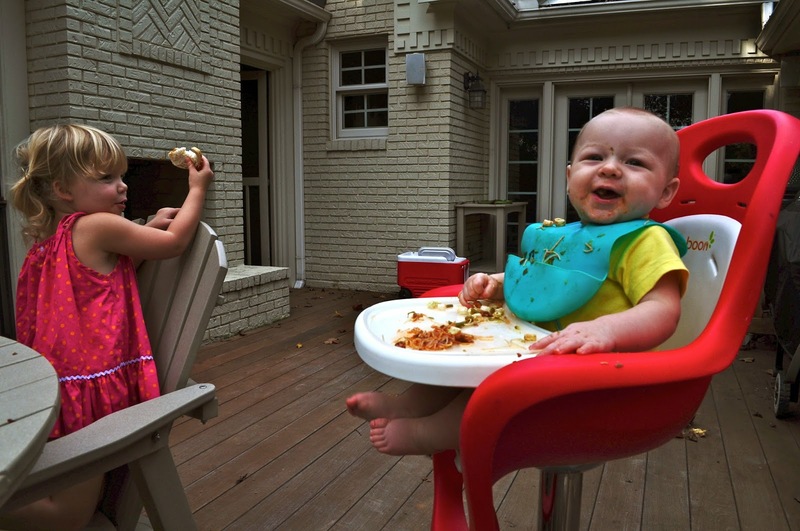 DH wants to go to Leigh's house every day now, after her son, Carter's first birthday. Baby pool and that Step 2 roller coaster? She was in heaven. Toddler food at its finest! Mama baby selfie. I got into the action with a baby shower and watching the UGA and the UT games out at a friend's house, but of course I have no pictures of that. Sunday night Dell Harper and I "made" star cookies. I tried rolling out a tube of slice and bank sugar cookies, and quickly realized this would not work out like I had envisioned. 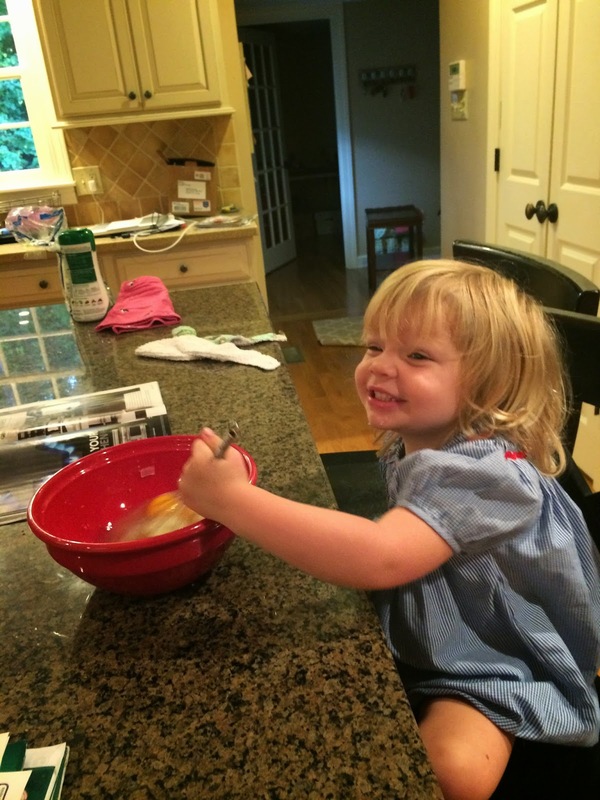 However, she had a blast dumping sprinkles and playing with the dough (with clean hands). The cookies were more lump like than stars, but they tasted good. We enjoyed them at the planetarium yesterday. 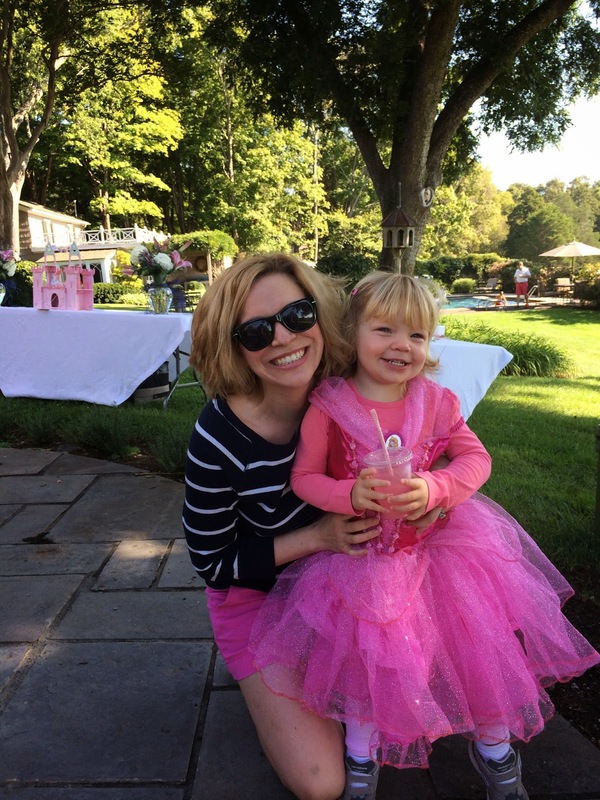 Just like Fancy Nancy in "Fancy Nancy See Stars". When she someday questions my mothering skills, I will just remind her of the fact that I made star cookies and took her to the planetarium and she really liked me when she was two. Hee. Dell Harper and Deeds exactly two years apart at 7 months and change. Deeds new bag? 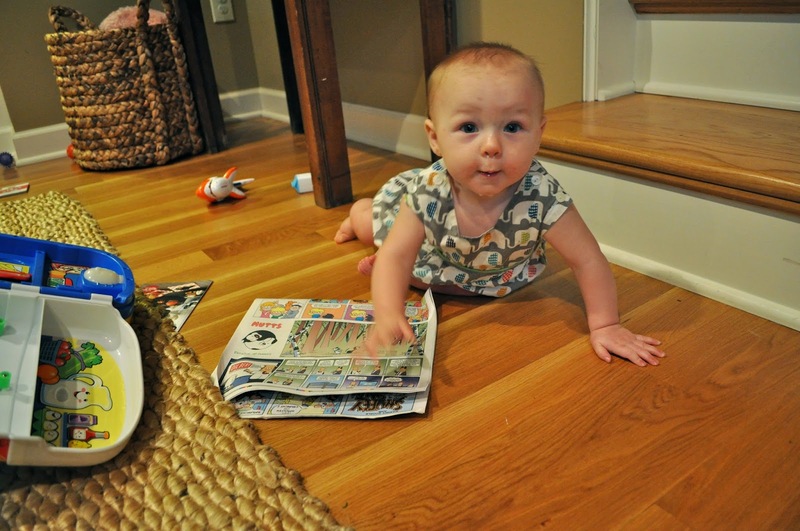 Crawling over to the coffee table, pulling up on his knees, removing every catalog and magazine, then chewing on the edge. Said coffee table purchased for $20 on Craigslist, and chalk painted by moi. Probably not the best thing for him to be gnawing on, but once again, the reason I refuse to buy expensive things for the foreseeable future. No wonder a nervous breakdown is imminent. Blogging break is over- time to pick up kiddos from school then get back to work (deep breath, deep breath).